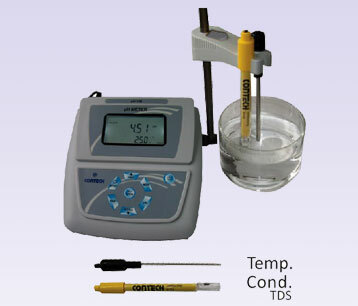 Contech Laboratory Conductivity Meter can measure Conductivity, Resistivity, Total Dissolved Solids(TDS), Salinity & Temperature of any solution. This instrument is suitable in the field of water quality monitoring, aqua culture, biological agriculture, scientific & educational research, food safety, petrochemical and environmental protection. It uses ECNG01 glass electrode with a platinum plate sensitive element coated with platinum black to avoid errors due to polarization especially in solutions of high conductivity. 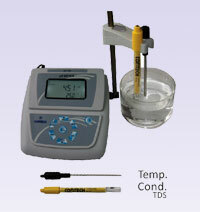 Conductivity, resistivity, total dissolved solids(TDS),salinity & temperature measurement.